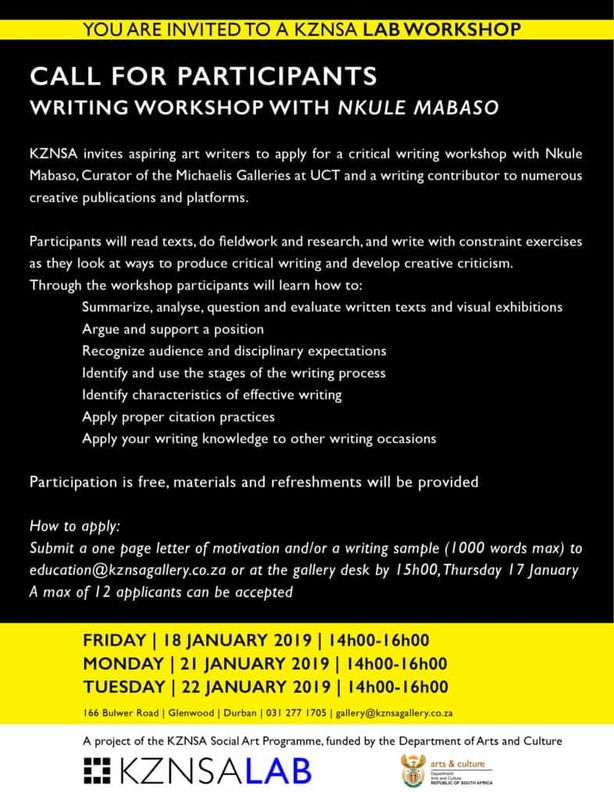 KZNSA invites aspiring writers to apply for a critical writing workshop with Nkule Mabaso, curator of the Michaelis Galleries at UCT and a writing contributor to numerous creative publications and platforms. Synopsis: Participants will read texts, do fieldwork, research, and writing with constraint exercises as we look at ways to produce critical writing and develop a creative criticism. Nkule Mabaso, Curator of the Michaelis Galleries at UCT and writing contributor to various platforms and publication. Submit a one page letter of motivation and/or a writing sample (1000 words max) to education@kznsagallery.co.za or at the gallery desk by 15:00 on Thursday 17 January. A maximum of 12 applications will be accepted.